Naughts & Cross stitches: Well... It's finished! I haven't been able to put it down! But it is finally finished! I have a really really bad photo to show you but I couldn't wait to show it to everyone! I haven't been able to stitch on anything else since I realised how close I was to finishing it. I will get a much much better photo as soon as I can but I just had to show everyone. 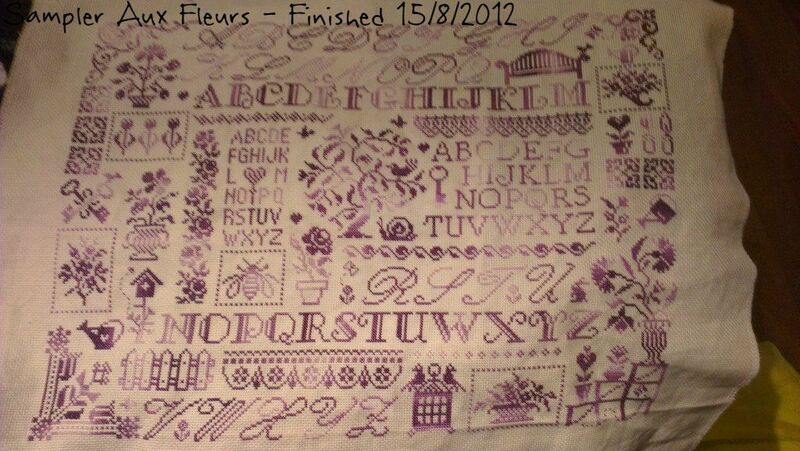 It is Sampler Aux Fleurs by Jardin Prive stitched on 14ct cream aida with DMC 52. I adore the colour and it has been so much fun to stitch. The first recorded photo of this piece was on the 11/3/2012 so not a bad effort to finish it in August. Its beautiful and a lovely colour! I love it when you can see the end of a project. I just discover your beautiful blog. Your work is very lovely. Succes with a new start! Gorgeous finish , well done. ! Congrats on the lovely finish!!!! That is just gorgeous. Well done, you! How many skeins of thread did you get through on that one? Wow. What a gorgeous finish! Love the colour. Congrats on the finish Caitlin. What a stunning piece. I love the floss color you used. It's GORGEOUS! Congrats on this amazing finish! It is fantastic. You make a great job. I love this pattern very much. Es sieht bezaubernd aus . Ich liebe Deine Stickereien. I love this sampler and the colour you chose. Now we need close-ups and nice pictures! !